Although you may think swapping that steak for a chicken breast is a healthy choice, you may want to reconsider. 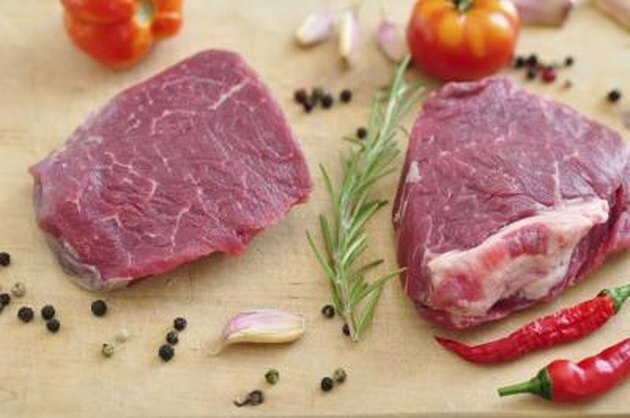 Although red meat has a reputation for being high in saturated fat and cholesterol, lean cuts of red meat are packed with protein, iron, zinc and B-vitamins with a minimal amount of saturated fat. These nutrients are especially important if you're active, as they help your muscles rebuild, produce energy and stave off illnesses. Including a moderate amount of unprocessed red meat into a balanced diet will provide key vitamins and nutrients. A 3-ounce portion of beef flank steak has 24 grams of protein and 165 calories, making it a protein-dense option. Your body needs the amino acids in protein for building muscle tissue, enzymes and certain hormones. Although your body can synthesize some amino acids, you must get the remainder from the food you eat. Beef contains all essential amino acids, and the protein is easily digested and absorbed by your body, according to a 2004 review article published in the "Journal of Sports Science and Medicine." Red meat is a good source of iron, with 17 percent of the recommended daily allowance of iron in a 3-ounce serving of beef chuck blade roast. Iron is a mineral needed for your blood cells to transport oxygen throughout the body and cell-growth regulation. Iron deficiency often causes symptoms such as fatigue, shortness of breath and difficulty concentrating that can interfere with optimal work and exercise performance. Although you only need a very small amount of zinc for good health, this mineral is essential for several important functions such as activating immune system cells and aiding the communication of neurons involved in learning and memory. A 3-ounce serving of flank steak provides nearly 40 percent and the same amount of lamb shoulder contains over half the recommended dietary allowance of zinc. Vitamin B-12, only found naturally in animal products, is necessary to keep nerve and blood cells healthy and is also important for synthesis of DNA, the genetic material in your cells. Inadequate intake and/or absorption of vitamin B-12 can lead to tiredness, weakness, megaloblastic anemia and nervous system dysfunction. Three ounces of broiled lamb shoulder contains more than the daily recommended amount of vitamin B-12, and the same amount of beef flank steak has more than 60 percent. While lean, unprocessed red meat is a good source of many nutrients, fatty or processed cuts are not a healthy choice by comparison. Much of the added fat on beef is saturated, which may not be healthy if you're at risk for heart disease. Furthermore, the added fat elevates the calorie content without increasing the beneficial nutrients, which could hinder your weight-loss or maintenance efforts if it causes you to eat too much for your activity level. Although processed cuts of red meat, such as bacon, sausage and deli meats, have similar nutrients as their unprocessed counterparts, their added salt and preservatives may increase cardiovascular disease risk, according to researchers at the Harvard School of Public Health. Journal of Sports Science and Medicine: Protein - Which Is Best? Medical News Today: What Is Zinc? What Are the Benefits of Zinc?